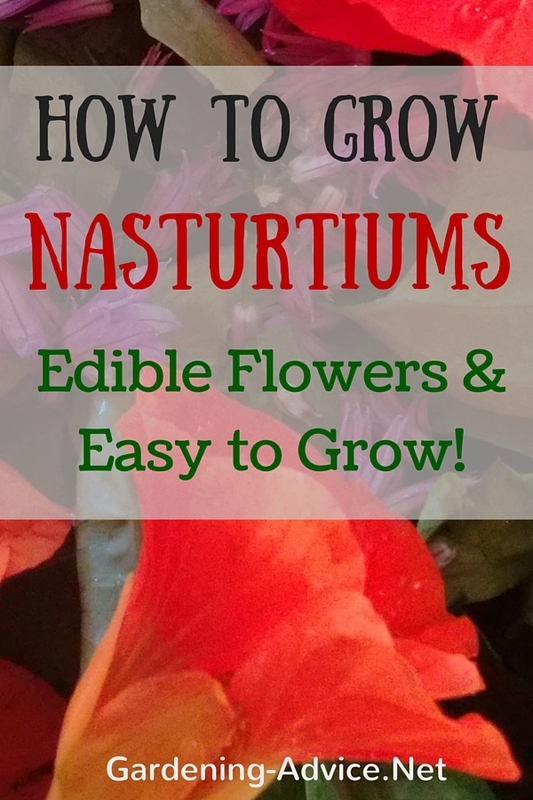 Growing Nasturtiums for Their Colorful Flowers And As A Culinary Herb! 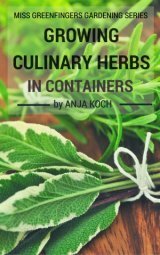 For Their Colorful Flowers And As A Culinary Herb! Growing Nasturtiums for flowers and as a herb is great fun. The cheerful Nasturtium flowers brighten up beds and containers. Nasturtium plants make your herb garden really pretty! Most people would look at Nasturtiums as being a flower but it is edible as well as very decorative and colourful. The bright orange, red or yellow Nasturtium flowers appear during the summer. New selections include compact varieties with deep red flowers (T. majus 'Empress of India') or speckled variegated foliage (T. majus 'Alaska'). There are two varieties to choose from depending on what you want them to do. T. majus has long shoots often 3 ft or longer. T. nanum in comparison grows more bushy and compact. There are many new cultivars out there so check the seed packet for size and growth habit. 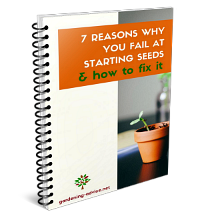 You can find a great selection of seeds here. 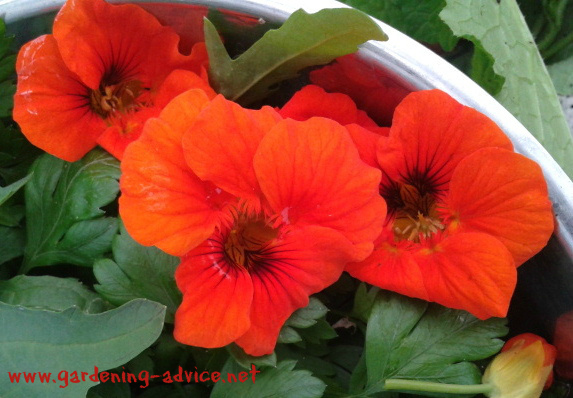 Make Nasturtium flowers part of your salad bowl...very tasty! 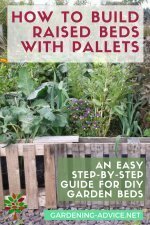 You can use the leaves, flower buds and flowers of Nasturtiums. The flavour is similar to cress but less peppery. Chop the leaves into salads, soft cheese, eggs and yoghurts but don't cook the leaves. The flowers can be used as colourful edible decorations and garnish. The unripe seeds can be used like capers and can be marinated in a salt brine or vinegar. Nasturtium plants are annuals and have to be started from seeds every spring. The seeds are quite large and can be sown right into the ground or pots about 3/4 inches deep. If you want your Nasturtium plants to flower early start them off indoors in March or early April. 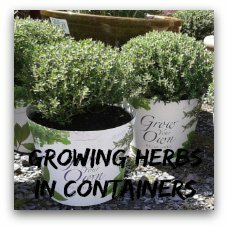 Plant them out or into the ground or bigger containers, hanging baskets and window boxes once there are no more frosts at night. Nasturtium plants don't do well inside. 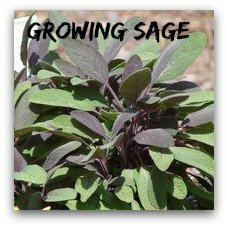 They are not suitable for an indoor herb garden but are great in larger containers on patios and balconies, for under-planting large container plants and edging of flower beds. 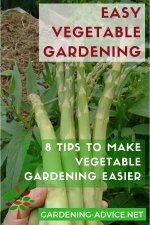 Don't hesitate to shorten the shoots if they get too long. Plant Nasturtiums in a sunny place. The ground should have good drainage but should not be too rich. Rich soil will encourage a lot of leafy growth but few flowers. 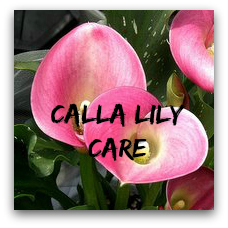 Plants in pots should be fed moderately but watered regularly. Nasturtiums will produce a lot of flowers until the first frost kills them off. They leave a lot of seeds behind though and usually self seed if the place suits them. 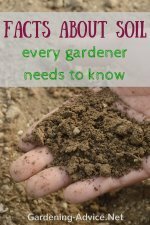 You can also save some seeds and keep them for the following year. Green and black flies like Nasturtiums. 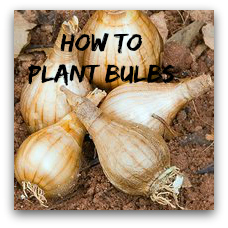 They are often used to attract these pests and keep them away from other cultivated plants. Harvest the young leaves and use them fresh. They are not suitable for preserving. 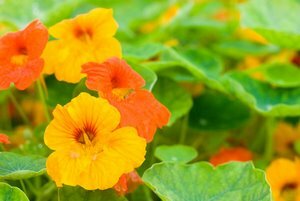 The flowers can be used for Nasturtium vinegar. The unripe seed pods can be used as a substitute for capers and can be marinated in a salt brine or vinegar. 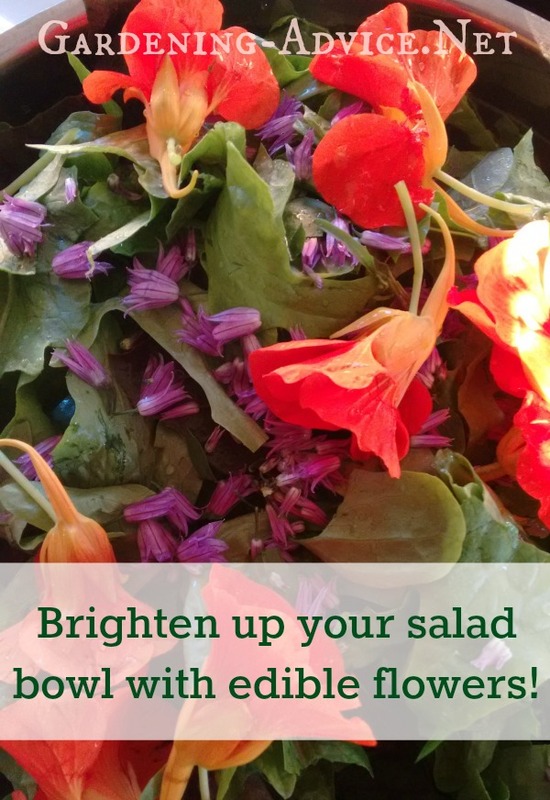 Add the colourful flowers to your salad bowl. The have a very interesting flavour: flowery with a spicy hot aftertaste.